Can you make the sun shine? Several days ago, as clouds sat low in the sky and rain threatened, Elspeth asked if we could go to the beach. I told her we might go to the beach some other day, when the sun was shining. Her immediate, perfectly logical response was to ask, “Mum, can you make the sun shine?” Upon being informed that I couldn’t, she then insisted, “But daddy can!” Eventually she was convinced of the uselessness of both parents, and began to say that she could to it herself! Naturally, her efforts came to nothing and the matter was forgotten. A few days later, on another wet and cloudy day, Elspeth decided to extend her search for somebody who could make the sun shine. 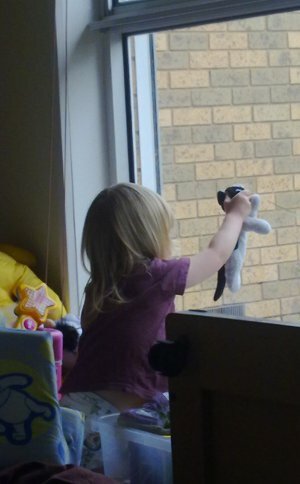 She asked several of her toys, holding each in turn up to the window to try. In a perfectly timed coincidence, just as she was holding up her favourite toy cat, Copernicus, the sun did indeed begin to shine. It was momentary, of course, and a moment later a cloud again blotted it out. So far, however, he has not been able to reproduce his initial success. I have never been the fittest or most active person on the planet. I’ve never been to a gym or attempted a marathon like some of my very admirable friends. I’ve always liked to walk, though, and prior to having children I did maintain a certain level of fitness. However, due to dizziness and discomfort during both pregnancies, movement was severely reduced. Even my walking took a hit. I suffered for it, losing fitness despite keeping my figure. Second time around was worse, and I now find myself short of breath after only a brisk walk to the shopping centre less than 2km away. So now, prompted by my outbursts of “I want to get fit!”, Aidan has taken the matter in hand. He already has a training regime in place for himself, but now he has added elements specifically for me and included me in some of his regular things, keeping in mind my current limitations (my episiotomy and my separated abdomen). One of those new elements is boxercise. I confess to a some hesitation at first. I have a self-consciousness about trying new things like that, and my initial instinct was to refuse. However I told myself firmly that, whilst Aidan could push me and motivate me and encourage me, the ultimate responsibility for the fitness I wanted lay at my own door. So I stepped up to the plate, said yes, and began. The training circuit Aidan has devised currently rotates boxing, skipping (yes, the kind with ropes, it’s like being back in primary school), and push-ups. Despite finding it difficult (especially the push-ups; the upper body has never been my strong point), I find that I come away from our sessions pleasantly exhausted. In defiance of my fears, I’m not dying or even being tortured by it. Exercise produces endorphins, and endorphins make you happy. It’s tough right now, and I can’t do very much at a time, but I know that my capabilities will build up over time, particularly as my body heals and can be pushed harder. Maybe one day I will be joining Aidan for his entire circuit, including running and doing strange things with the medicine ball! In weeks, months, and years gone by, I’ve tried my hand at various crafty or creative things. I’ve scrapbooked, I’ve photographed, I’ve done NaNoWriMo (several times), I’ve even tried needlepoint – which I found rather boring, to be honest! I’m a creator on the Discworld MUD (my only current creative project). And obviously I’ve blogged. But as time goes by, and children enter the equation, creative energy has become limited. I want to do more scrapbooking and writing, I would really love that. I want to do NaNoWriMo again this year. I want Evelyn to grow up and see her own life celebrated in scrapbooks as well as her older sister’s! But I feel that these things require more time and effort than I can really spare to invest. They require the re-engagement of my imagination, which is currently limited to thinking up new ways to get my family fed! I begin to wonder about my priorities. It is clear that my family, my children, must come first… but where do I draw the line, when is enough simply enough? When do I get to follow my own interests, free from distraction or guilt? And how important does something have to be before I feel justified in trying? Ultimately responsibility lies with myself. If I feel the need, I must put aside the time and make the effort to create something. I think, right now, I shall organise to have some digital photos printed out nicely to scrapbook! Wish me luck. At the age of 28, I still remember being young. Well, ok, I am still young, but I recall being younger, and even sillier. What I mean to say is, I can remember a time when certain things I know now seemed ridiculous. Life teaches one many things which really only come with time and experience, and I recall enough to know that telling a youngster those things is a waste of time. One of the things I’m referring to is the ability to control one’s emotions. This is something that even now I struggle with, but I’m beginning to realise it is possible. 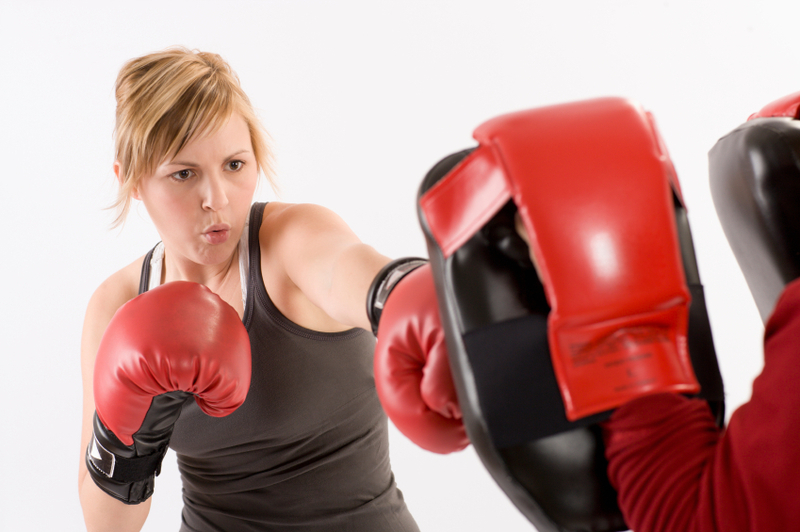 It is not necessary to give in to anger or fear; reining it in is easier than you might think. A few times lately I have felt frustration or impatience rising within me, usually related to the behaviour of one or both children. However all it takes to stem that is a quick, deliberate injection of rational thought to the situation. So I’m bored sitting by Elspeth’s bed for so long waiting for her to sleep? What the hell else would I be doing with that time, I ask myself – and the answer is nothing very interesting or important. Result: instant acceptance of what I’m doing. So I just had to stop typing this blog post for twenty minutes to play with blocks? Oh no, what a tragedy. The computer isn’t going anywhere. All that I typed was still here when I came back. No big deal. I think sometimes it’s easy to get caught up in what you’re doing or what you want, and you can forget that in the big scheme of things it really isn’t that important. Reminding yourself of how unimportant so many things really are is a big part of staying calm when those things are interrupted, stopped, or prevented. Mothers often hotly debate the ethics of reprimanding someone else’s child. But I can now tell you from direct experience, if your kid is chasing others around and grabbing them by the head while you sit idly by, I’m going to tell him off. Especially when he’s twice their size. And yes, I reserve the right to reprimand you for your complete lack of parenting, too. Yup, this is what happened today. There we were, happily playing in the playground, when some obese four year old (according to his grandfather; he looked about eight to me) started grabbing at Elspeth. I’m not too sure what his aim actually was, but she obviously didn’t like it, and ran away. The boy chased her. She ran to her daddy, who picked her up to comfort her, and the boy kept trying to grab at her legs even then. I told him, firmly, to leave her alone. Then the cheeky bugger chased me, trying to defend himself. I ignored him and went back to my seat. I thought little more of it – an odd, isolated incident, right? Until I saw him do the same to another child, only more roughly. This time he was ripping at a boy’s clothes, it looked like he was trying to lift him up by the neck of his shirt. That boy also ran away, and was chased all the way to his mother. Then it was Elspeth again, and Aidan did his stern-voice on the bully. I couldn’t hear what he said, but I could hear his tone from across the playground. It was then that I decided it was time to give his grandfather a boot up the bum. All the while, pops had been sitting watching this kid, saying and doing nothing. So I said, “That boy is harassing and upsetting the other children. You might want to have words with him.” My tone, I think (I hope), was firm and disapproving and filled with motherly authority. Pops response to me was weak and quavering: “He’s only four. He’s trying to make friends. You can’t make friends without speaking to each other!” Making friends? Speaking? I wouldn’t have minded if that was what he was doing! I made my scorn for that statement quite plain, and pops packed up his over-indulged grandson and left. In hindsight, with emotion removed, it is true that I can’t really blame the boy. His supervision today, in the form of his grandfather, was woefully inadequate, and I can only assume the parenting he usually receives is of similar standard. But he’d better learn some appropriate social skills pretty soon, or somebody’s going to punch him. With any luck, it will be Elspeth. The Maternal Child Health nurse came to visit us today, to check on Evelyn and I. She was quite nice, and a lot of the information she covered was normal, common sense stuff. She also mentioned that Aidan and I should get our whooping cough vaccinations updated, and a couple of other helpful things. It was, on the whole, a helpful and beneficial visit from a lovely nurse. But she did give us one brochure that simply boggles the brain. Really? They have to tell people this? It’s such a problem that the State Government of Victoria has deemed it necessary to spend money on putting one of these brochures into every pack for every new parent? I’m just astounded. I shouldn’t be, I know. There are crap parents out there, there are people who simply don’t know any better. But I would have assumed that those people were the minority, the exception to the rule, as opposed to being halfway normal. I’m going to start at midnight. It is, technically, the start of the morning, and it is when Aidan and I went to bed after watching the last of Dexter season 5. Sleep came slowly, and was interrupted at about 1.30am when Evelyn woke up hungry. So I fed her, being careful to burp her frequently (she had a bit of trouble with gas yesterday), and then went back to sleep as soon as she did. She woke up hungry again at 5.30, as expected, but this time I prodded Aidan and got him to feed her. It was cold out of bed, I didn’t want to get up! However, warmth was all I got; despite being in bed I didn’t sleep while Evelyn was awake. At around the same time, Elspeth decided it was time to get up. Properly up, fully awake, wanting play time and books. No snuggles in bed this morning, no snoozing till 7. Aidan and I were both up, but he looked more sleepy than me so I sent him back to bed and have stayed up with Elspeth ever since. It’s now nearly 8am, and I still feel like it’s the middle of the night. I think I will be trying for a nap later!